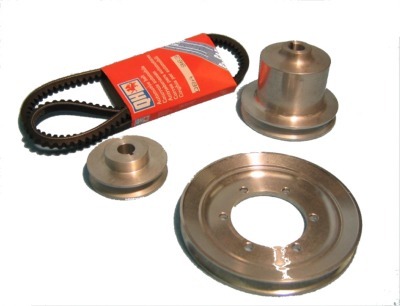 This is a Aluminum Pulley Kit that coverts to a modern narrow belt for a Triumph TR2, TR3, TR4, TR4A. Reduce the rotating weight and reduce friction with a smaller belts. Plus in the future when you need a new belt you don't have to worry about trying to find a belt. The belt is a modern 3/8 inch belt that can be purchased at any auto parts store. Kit includes, water pump pulley, generator pulley and crank pulley.